Twenty-five young community leaders from Africa recently spent six weeks in Arizona for intensive hands-on education and leadership training with the ASU College of Public Service and Community Solutions. They are part of the Mandela Washington Fellowship program, created by President Barack Obama in 2010 to help educate the next generation of leaders in Africa. The fellows wrapped-up their stay in Arizona with a formal event in downtown Phoenix in which they gave presentations about the projects they are undertaking in their countries. “My goal is to contribute to sustainable development by advocating for STEM (Science, Technology, Engineering and Math) education,” Sie Nyamande told the audience. Nyamande is a scientist and team leader for a nongovernmental organization called Environment Africa, based in Victoria Falls, Zimbabwe. “I believe that through this initiative we are building a country,” she said. The fellows are addressing some of the most pressing issues facing their communities in Africa: providing education for kids who otherwise have no means to escape poverty; empowering children with HIV to do more than cope; improving learning and employment prospects for people who are disabled; and creating economic opportunities for women where few exist today. Sallieu Timbo is an assistant program coordinator in Freetown, Sierra Leone, for Restless Development, an international organization that works with youth. His focus is on improving opportunities for girls who have a high rate of dropping out of school, are forced to marry as young as age 13 and can be victims of domestic violence. He wants to change that. The 25 men and women are among 500 chosen to participate in the annual fellowship program. They were selected from a pool of 30,000 applicants representing the fields of business and entrepreneurship, public management and civic leadership. ASU is one of 20 universities that hosts fellows and provide learning opportunities. The program is administered by IREX, an international nonprofit that implements leadership and education programs worldwide. Its CEO, Kristin Lord, attended the presentations by fellows and showed her appreciation for the work they do. 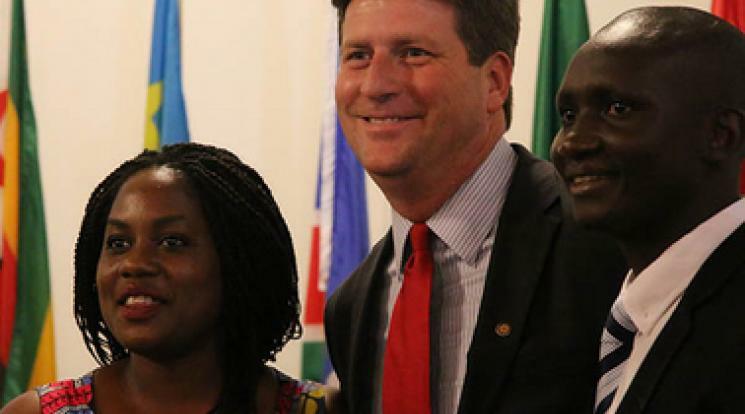 Phoenix Mayor Greg Stanton congratulated fellows for braving Arizona’s summer heat and for inspiring those who came into contact with them. “Each of you fellows here today represents the hopes and aspirations of your families, your home nation and those of us here in the United States who understand that the future of our world depends on the strength of our relationships among nations — particularly Africa moving forward,” Stanton said. After the event, Stanton talked about the need for Phoenix to expand its dealings with nations in Africa, suggesting increased commerce would benefit the local economy and help the nation overall. ASU hosted its first class of Mandela Washington Fellows last summer and incorporated feedback from that cohort. Newell credits a dedicated ASU staff and several community partners for making the six-week session worthwhile for the fellows. It included sessions with professors, community leaders and public service professionals. Fellows were also introduced to many cultural attractions, including the Heard Museum and the Desert Botanical Garden in Phoenix and the Arizona-Sonora Desert Museum in Tucson. They took in a professional baseball game and were given a behind-the-scenes tour by the Arizona Diamondbacks staff, and they experienced the Old West with a trip to Old Tucson Studios. Although the excursions were appreciated, fellows really enjoyed the opportunity to partner with local nonprofits in Phoenix, Tucson and Flagstaff. The fellows also visited with staff from the International Refugee Committee and met recent immigrants from Africa. They learned about the agency’s efforts with refugee resettlement and discussed issues they both deal with – forced migration, health, education, women’s empowerment and LGBT communities. Staff gave the fellows a tour of a community garden and discussed the committee’s micro-enterprise programs in Arizona. In Tucson, fellows visited the Community Food Bank where they learned about the serious issue of hunger in Arizona and the role food banks play in meeting an important need. They also helped with the packaging of food. The six-week program included a couple of weeks in Flagstaff where they enjoyed cooler weather and the chance to learn from community leaders. A highlight included a trip to the Hopi reservation where fellows learned about the tribe’s culture and watched a Hopi rain dance. Fellows also got to visit the Lowell Observatory and see the Grand Canyon. While in Flagstaff, they learned more about introducing the concept of community gardening to youth with a visit to local nonprofit Terra BIRDS, while putting in some time in the garden. Emily Rubooga, who works with youth for a nongovernmental organization in Kampala, Uganda, was thankful for the opportunity to visit several nonprofits. She plans on advocating for the creation of neighborhood gardens in the communities she serves. Following their six-week session in Arizona, the fellows will spend a week attending learning and networking sessions in Washington, D.C., where they will be the guests of an event with President Obama. Fellows have the option of taking part in a six-week internship in the United States before they return home. They will also be offered follow-up training and educational opportunities in Africa over the next year.